CWU's Union Safety Reps are often forgotten for their activities within their local communities, let alone for the work they do in supporting the Union's members in their working environment, protecting them from injury and ill health and upholding health and safety at work legislation. Their level of expertise and training, which means they often have a stack of initials after their names, e.g. RSP FRSPH MIIRSM MIIAI MITP TechIOSH, is backed by the CWU's education programme; making our Union Safety Reps; 'persons of interest' within their communities and that of local politics too. One such individual is our own Chair of the NW BT Unions H&S Co-ord, Derek Maylor; whose list of initials following his name are detailed above. 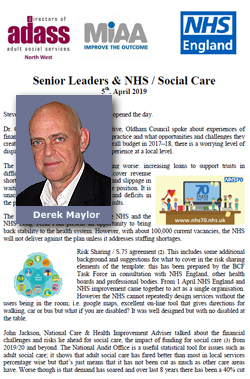 Active in his local community in education and healthcare, Derek attends meetings and presentations and is often plays a part in the decision making process in areas affecting his local community, and indeed the wider community of health and safety, education and healthcare. 'The NHS’s financial health is getting worse: increasing loans to support trusts in difficulty, raids on capital budgets to cover revenue shortfalls, and the growth in waiting lists and slippage in waiting times do not indicate a sustainable position. It is unacceptable to simply offset surpluses and deficits in the presentation of these overall budget results. The long-term funding settlement for the NHS and the NHS Long Term Plan present an opportunity to bring back stability to the health system. However, with about 100,000 current vacancies, the NHS will not deliver against the plan unless it addresses staffing shortages. Read Derek's full report of the event by clicking on the pic above or following the link above.